Two national nonprofits and a major out-of-state corporation are some of the million-dollar donors to campaigns for state questions appearing on the ballot. Voters will be asked to decide seven state questions, among them an education tax, wine and strong beer in grocery stores, farming rights and changes to the criminal justice system. Supporters of a proposed 1-cent sales tax increase to fund teacher raises and other educational initiatives have generated nearly $4 million in contributions, while a group supporting criminal justice measures has raised more than $3 million, according to campaign finance reports filed Monday with the Oklahoma Ethics Commission. Walmart has given more than $1.6 million to a campaign to update the state’s liquor laws, making the Arkansas-based business by far that proposal’s top funder. Below are the total contributions and top donors to major political action committees taking a stance on one of the seven state questions. Totals are through Sept. 30 and include in-kind donations of goods and services. 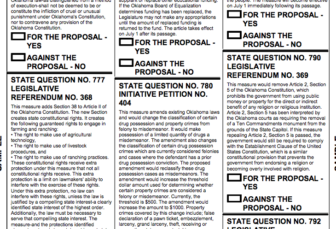 This in-depth Q&A will help you decide how to vote on State Questions 780 and 781, which are intended to lower Oklahoma’s incarceration rate and divert more offenders to treatment programs.